If you are looking for protection for a construction site or event venue that is efficient and cost-effective, American Fence Company of Lincoln has your answer. They make renting temporary fence quick and easy. 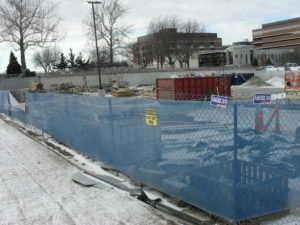 Rental fencing guarantees that your site will stay secured while remaining flexible to your needs. Portable panel systems: Used for construction sites and venues where temporary fencing will need to be adjusted and moved around, or is placed directly a concrete base. This style uses a panel and stand system. Screened temporary fence: This style is perfect for creating privacy for events or job sites, but is also capable at preventing dirt and debris from blowing into public spaces. Usually includes in-ground fencing and windscreen. In-ground temporary fence: This is the most widely used and solid construction site and event venue rental fence option. It consists of posts that are driven securely into the ground. American Fence Company of Lincoln is an expert in the field of temporary fencing and they will do everything they can to assist you with determining the best solution for your temporary fence needs. Give them a call today at 402-467-2511 or submit an online request for a quote for a free consultation.